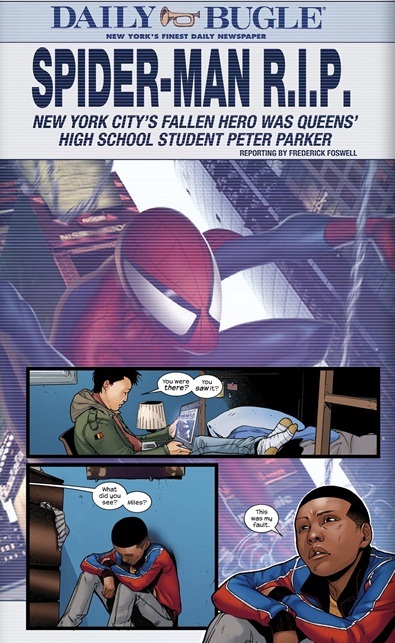 Miles rushes out of school and races to the battlefield of the Green Goblin and Spider-man. He witnesses Peter Parker’s last moments with Aunt May and Mary Jane. The death of Parker prompts Miles to be more selfless and outgoing. He attends Peter’s funeral. He inspired after talking with Gwen Stacey at the funeral and makes up his mind to honour Peter Parker by carrying on his legacy. Miles dons a spider-man costume from a store and get photographed crashing into a store’s glass window. That night he tries again as he heads onto the rooftops and gets attacked by Spider-woman. Cover- I think we know by now this series always has a great cover. Story- Still the slow burn of a weekly soap opera continues. To Bendis credit things are finally getting to where I want it, we are literally on the cusp of Miles becoming his own Spider-man. How long will it take? Brace yourself Bendis believes in a slow burn! 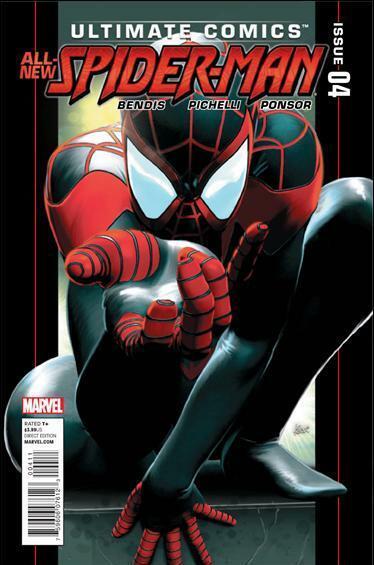 Characterization- The reason this book works at all is the level of humanity invested in Miles Morales. Only Jason Rusch, Peter Parker and Kyle Rayner have this level of development as a person in addition to heroics. He’s young, naive and inexperienced and all this makes him endearing in a much different way than the characters I mentioned. His best friend also adds depth to Miles by being the anti-him, it allows Miles personality to shine. Pacing- Listen taking your time is one thing but c’mon Bendis pick up the pace!